Join National Drug and Alcohol Facts Week® by sharing why you want to SHATTER THE MYTHS®! Print this pledge card (PDF, 726KB), fill it out, and submit using the instructions below. Ask each participant to write “WHY” they want to SHATTER THE MYTHS® about Drug Addiction. PRINT in bold letters a short phrase (depending on space). Pictures can be taken with a smartphone, personal camera or webcam. Group shots of more than three people are not recommended. Send digital files (no PDFs) to nidamultimedia@mail.nih.gov. Include with your submission the correct spelling of each participant’s name, age (or school year) and name of organization/school. If photos are part of the NDAFW campaign, please also include information about the event. Files must be 15 MB or smaller. Ask each participant to write a phrase about “WHY” they want to SHATTER THE MYTHS® about Drug Addiction. Record participant saying, “I want to shatter the myths because,” along with their “WHY” phrase. Videos can be taken with a smartphone, personal DSLR or webcam. *Group videos are not recommended. Send digital files of raw video clips via email to nidamultimedia@mail.nih.gov. Sorry we can’t accept URL links to video channels. Include with your submission the correct spelling of each participant’s name, age (or school year) and name of organization/school. If videos are part of the NDAFW campaign, please also include information about the event. Files must be 15 MB or smaller. Multimedia means any video, photograph, artwork and/or other materials or information you send to nidamultimedia@mail.nih.gov. All submissions require participants under the age of 18 to have their guardian sign a Multimedia Release Form* (PDF 191KB). *By signing this form, you acknowledge that NIDA has a non-exclusive, perpetual and royalty-free license to use any material received to promote its science-based resources and the National Drug and Alcohol Facts Week® campaign. 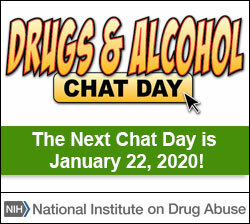 The National Institute on Drug Abuse has the right to remove any multimedia from its website.